Learn how to find hidden bank accounts and more. Assets, typically, are a good thing. Hidden assets often have a ring of hope or criminal suspicion tied to them, depending on the person and scenario. Finding hidden assets is anybody’s game, especially when there is something to be gained or lost by doing so. Experience has shown that individual’s needs for an asset search rang from wanting to know how to find out if someone has a secret bank account to finding lost family assets. Private investigative services, like Lawrence Ryan Investigations in Chicago, regularly conduct these services for clients. 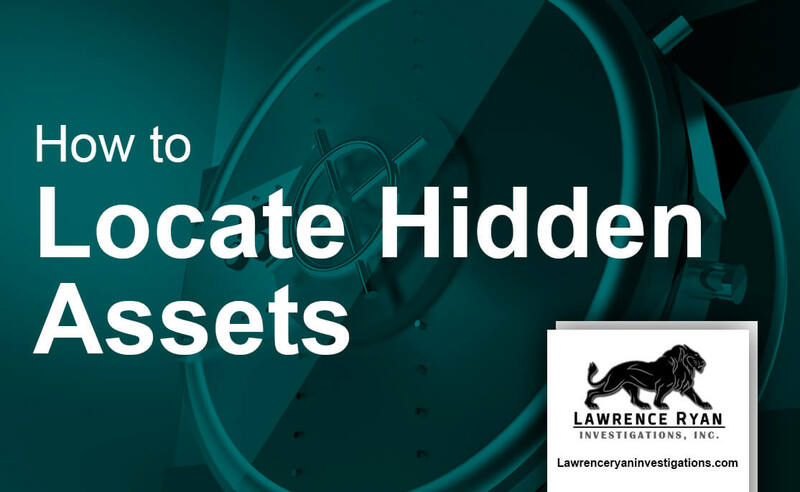 This article highlights the following reasons, scenarios, and benefactors of hidden asset services and will shed light on why anyone would want to go through this process. Asset discovery is a painless process, but you need to understand certain facts to get the best results. If you answered yes to one of these questions, an online asset search is not going to work. My husband says he can’t afford child support because he is unemployed. I know he is working. How do I prove it? I won a civil judgment, but I can’t find bank accounts or assets. Where can I look? I’m getting divorced and my spouse is hiding money in an undisclosed bank account. Can I find hidden bank accounts? Before I enter into a new business venture, I need verify to assets but I don’t know where to look. Is it possible to search nationwide? You are going to need a rigorous and dedicated search performed by experienced specialist to get the results you need. On the internet you will find companies that offer an instant asset search like the image below. Sounds great, right? The reality is dim. These searches are limited in scope and access to the data you need for a successful search. For example, these searches cannot and will not find income streams, bank accounts, or investment accounts. What they will do, is scrape publicly available records for assets such as automobiles and real estate. Each search needs to be tailored to your specific needs. Successful searches have helped individuals in a wide array of cases. Below we will explore asset search cases. W.C. Fields, a famed actor and comedian, was notorious for setting up bank accounts all over the globe, then hiding piles of money in them. This eccentricity had everything to do with convenience and the fear that American banks would crash again (as they did during the Great Depression of the 1930’s). It was not an uncommon practice during that time (or even now) for people to stash their cash assets in any place they could. The feeling that spreading the cash out would somehow protect it from disappearing entirely. However, the problem arises when heirs to these assets have no idea where they are located because mom or dad failed to provide banking information in the wills. To locate hidden assets could mean the difference between riches and comfort and ongoing poverty. Since looking for checking and savings accounts is really no different than looking for a missing person, a private investigator is a good option for the job. The quality of the private investigator will depend on the network they have at their disposal. The depth and strength of their relationships will determine their ability to deliver results. Finding assets hinders on an investigators ability to go deep and far in their research. Suspicious criminal activity linked to hidden assets is the oldest trick in the book. Bookies that keep illegal bets and books have hidden assets. Mob bosses have hidden assets. CEOs and employees who are skimming money off the top for themselves have hidden assets. If you suspect any of these things are happening around you, you should be reporting it to the authorities and not attempting to find the assets yourself. The police will work with an investigator to track down the assets you suspect are hidden and uncover the criminals. In certain cases, it can take time and effort to locate these hidden books, bank accounts and laundered money. Especially if there is not a lot of information to work with. Stolen identities are another reason why you should look into hidden assets. If someone has recently stolen your identity, tracking down all of the credit card accounts and banking accounts in your name will lead you to the person responsible. Since you do not have the time, energy and resources it takes to do this work yourself (and probably not the education either), the services of a P.I. suddenly become an invaluable tool in the process of uncovering hidden assets that are actually stolen assets. Of course, there is also the domestic (and almost criminal) activity of spouses who are trying to hide assets during a divorce. If there is substantial wealth, but you cannot prove it, a judge may request that an investigation be conducted into where the money, stocks, bonds, CDs, etc., have all gone. Most states during divorce hearings require a full financial disclosure from both spouses in order to make a fair order of spousal and/or child support. When you suspect or absolutely know that your spouse is hiding assets, a P.I. can find hidden banks accounts and assets as well obtain documentation of what they are and where to find them. Unfortunately, that is the limit of things because the accounts and assets are in your ex’s name, but at least the judge can see that there really are hidden assets. Then the judge can order your ex to reveal these assets in court via a subpoena of records for each institution where the assets are hidden or held. Your spouse then has to comply with the subpoenas, as do the locations where the assets are hidden, or suffer fines, penalties and possibly jail time. Finally, there are hidden assets that people often forget they even have. Life insurance policies that have matured or have been closed, savings accounts that were left behind during a move, investment accounts that have grown substantially and have been forgotten- all of these are hidden assets of the forgotten kind. Many times, the companies or organizations wherein you opened these accounts will leave them open for several years, attempting to connect to anyone with a familial connection to you. When that fails, these companies or organizations place the assets in special accounts that are only accessible to the person or persons named on the accounts. If you think you have any assets that are just hanging around out there, you can actually check with a couple of special websites sponsored by the states in which you have lived. You will need your name and some other identification that proves you are you before you can open any files that show available, missing and/or forgotten assets. Some people are often surprised to find that they have trusts, inheritances, cashed out values on life insurance policies and banking accounts with quite a bit of cash in them. If you are not sure where to begin looking, a private investigator can assist by creating a strategy that gives you the highest opportunity for success. No matter if you want to know how to find hidden assets of deceased family member or how to find money your spouse has hidden, a strategy can be created for you. He or she can help you find assets nationwide. By utilizing a vast network of databases as well as using manual investigations techniques, with any luck, you could have quite the windfall awaiting you. When you start your search, ask questions about how the investigator performs the asset search. Is it just a database search or are they also do manual investigation work. If they are using databases, how many? Some investigation firms have limited access to the databases that can deliver the information you are looking for. Another factor is the type of asset you are looking for. Confirm that they are able to perform a search for the type of asset you are looking for. These factors will also determine the pricing of the asset search services. There can be a difference in price depending on the type of asset as well as where you need to look. A state search will be less that a nationwide search. As a private investigator in Chicago, Illinois, we bring over 38 years of law enforcement and investigations experience to bear on one goal: discovering the truth for our clients, whether that be catching your cheating spouse, winning a custody battle or divorce, or busting a stealing employee. LRI is a BBB accredited private investigation firm with A+ rating. We go above and beyond to locate hidden assets. Our searches tap into the major databases across the country as well as a specialized team of investigators that perform manual searches. This combination gives us a much higher success rate then other firms, and in turn a better return on your investment. 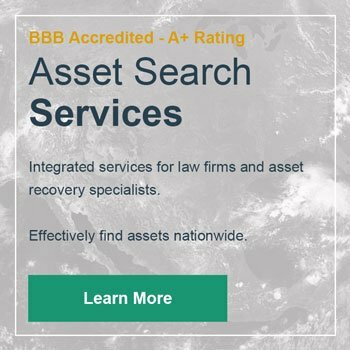 Contact an LRI investigator for more information on asset searches.